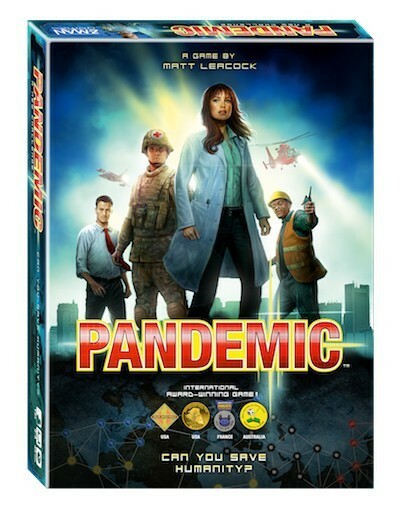 Publisher(s) F2Z Digital Media Inc.
Pandemic: The Board Game is a port of the 2008 board game designed by Matt Leacock that took the gaming world by storm shortly after release. Now it is 5 years later and Pandemic is on its second physical edition and still one of the most unique board gaming experiences out there and still a best-­selling game with multiple expansions, and likely more on the way. In Pandemic, you take on the role of one or more CDC workers attempting to eradicate the diseases spreading quickly throughout the world, and trust me, it ain’t easy. Each player has a different role to fill from engineers that build satellite CDC bases for free, scientists that let you find cures quickly, and others that let you reuse cards or transport players around the world in a flash. Each turn, you have 4 actions to use, and you can choose to Move, Treat, Cure, Share Cards or Build. While the rules of the game are very easy to understand, the game is very much against you at all times and becomes fiendishly difficult if you run into a streak of bad luck. After each player’s turn the diseases spread, which is represented by an infection deck where cards are flipped up based on the disease level. In the beginning, only two cards are revealed each turn, dropping a disease marker in those cities. If any of those cities have 3 disease markers already, an outbreak occurs. Each city with a link to the outbreak gets an additional disease marker, possibly causing more outbreaks. Epidemic cards in the infection deck further throw kinks in your valiant disease-fighting efforts by increasing the speed of infection (number of cards revealed per turn) and putting more pressure to wipe the board of disease. You will lose. You will lose many, many times. Then someday you will forget how frustrating it was to lose after an epic game and decide to try again, and when you eventually win it feels like you just saved the world. That feeling is what keeps me and my friends coming back to Pandemic. Those “almost got it” or “one more turn and we would have had it” moments really stand out in your memory and make you think you could win next time you sit down to play. 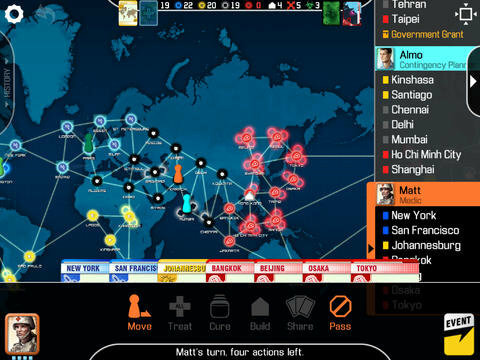 The iPad version really captures the essence and the tension of the physical game, but is lacking the one feature that I think every veteran Pandemic player was waiting for: online multiplayer. We have seen other games do it extremely well in the past, so I am sure that the developers are hard at work on an update. For now you can play single­-player or local multiplayer, but if you play single-­player you will be playing multiple characters, so there is really no difference between pass and play and sitting down alone. There is no option for AI controlled players, which on one hand makes sense as you can’t communicate and strategize with the computer, but it still would be nice to take the burden off you when you don’t have friends to play. 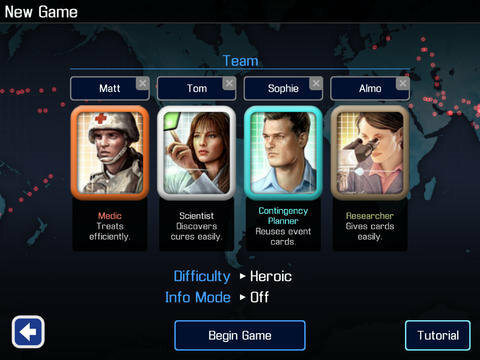 Hopefully the developer F2Z will see fit to include the “On The Brink” expansion in the near future which introduces the bio-terrorist game mechanic, and eventually bring in the recent “In The Lab” expansion as DLC. I will happily pay for both of these when they launch, as they can only make the experience more awesome. As it stands, the game is very polished but feels like there is limited replay value unless you have friends around. 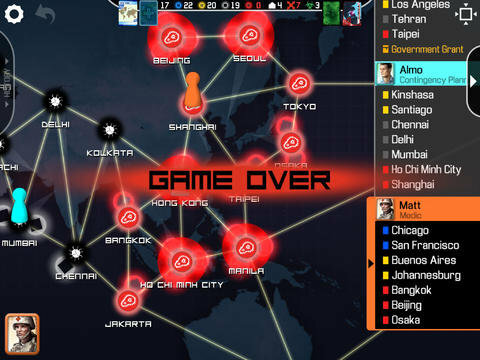 I really hate knocking games for what isn’t there, but the lack of stat tracking is a glaring omission in a game that can be as difficult as Pandemic. Add on the expansions, eventual multiplayer and some statistics of how badly I fail, and the game will be on my iPad for years to come. For now it remains but mainly is saved for the days I don’t feel like breaking out the physical game, but have an itch to save the world from colorful viruses.